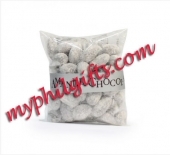 Roasted almonds coated in dark chocolate and powdered sugar. Shipping: Stricly Metro Manila Only. ame day delivery to Manila and next day to provinces, Cut off time for order received is 10 am local time. Order received after 10 am will be delivered on the next day. Our shipping charge is $7 nationwide. Item may be slightly vary depends on the availability of the item. However over all look and quality remain same. Please read our complete delivery policy in information section.